Bolivia Takes Chile To Court Over Access To Sea : The Two-Way The landlocked nation wants to reclaim access to the Pacific that it lost in a 19th century war. But it's unclear if Chile will submit to the International Court of Justice and engage in the process. 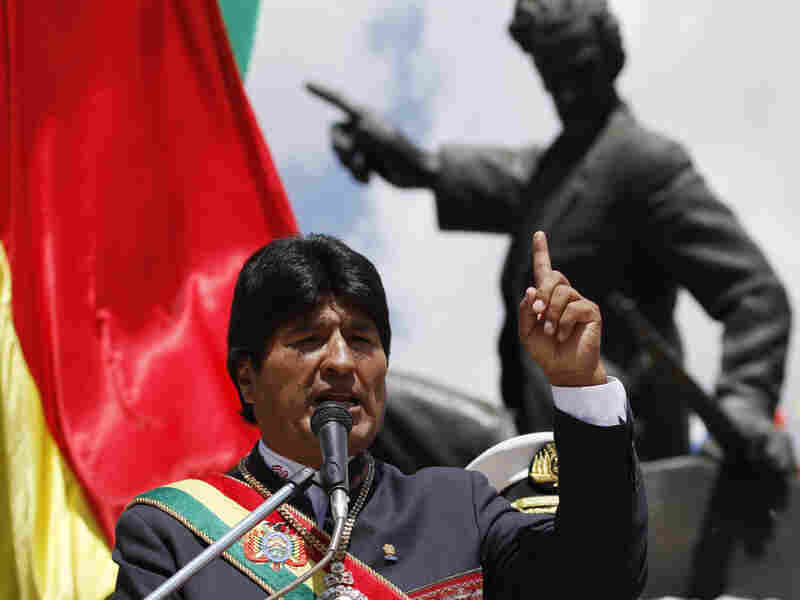 Bolivian President Evo Morales speaks last month at an event in La Paz to mark Sea Day, when the country lost access to the coast in a war with Chile more than 100 years ago. On Wednesday, Bolivia filed a lawsuit against Chile at the International Court of Justice to reclaim access to the Pacific Ocean. "At the center of the case is almost 250 miles of coastline and over 74,000 square miles of land, currently part of the Atacama Region of Chile. Long disputed between Chile and Bolivia, Chile took full claim to the territory through the War of the Pacific (1879-1883), and the ensuing Treaty of Peace and Friendship that officially established the borders and was signed in 1904." The suit "assumes the historical mandate of the Bolivian people to revert to being a maritime nation," Bolivian Foreign Minister David Choquehuanca said Wednesday while filing papers at The Hague. His comments were reported by Agence France-Presse. The BBC reports that Chile dismissed the move, saying "no-one in the world will accept that a country unilaterally dismisses a treaty which is in full force." "In order for proceedings to move forward, however, Chile has to agree to submit to the ICJ and engage in the process. If Chile agrees to participate, both nations would be bound to comply with the ruling, as stipulated by their membership to the U.N.
"Bolivia is hoping Chile will meet them at The Hague, as it did to a case brought by Peru over another maritime dispute. The Chile-Peru case, presented to the ICJ in 2008, concerns the sovereignty of offshore fishing waters. The proceedings in that case have concluded, and the parties are now waiting for a decision from the court." Although Bolivia is landlocked, it maintains a small navy; reclaiming the territory lost to Chile has been a national goal for decades. Relations between the two countries are limited, and past attempts to negotiate on the issue have failed.